Moer, I have been trying for 2 hours and can't get an image onto my signature. I uploaded photos to photobucket, right clicked, copy shortcut, pasted between brackets and get this: It was not possible to determine the dimensions of the image. Also how does one include these Smilies in your message body? Forgot to mention photo is resized to 120 x 70 pixels. Very small. Last edited by Cinco on Wed Nov 07, 2012 8:27 pm, edited 1 time in total. Wishing my life away till the next trip! is it possible to upload the photos straight from your local hard drive ?? Chris, the signature pics are not stored on the site database, so if one were able to upload direct of your local drive, your signature pics would be missing if you were not on line. Cinco wrote: Moer, I have been trying for 2 hours and can't get an image onto my signature. Ian, what program are you using to re-size your images? It could be that the actual size doesn't correlate with the reported size, ...... Cassie can help you more with the reasons for the error. IRO the smilies, they appear as BB codes in the message composition text box .... the actual smiley images appear in the posted text. I am using microsoft office (2010) picture software. Do you drag the smilies across? That doesnt seem to work? 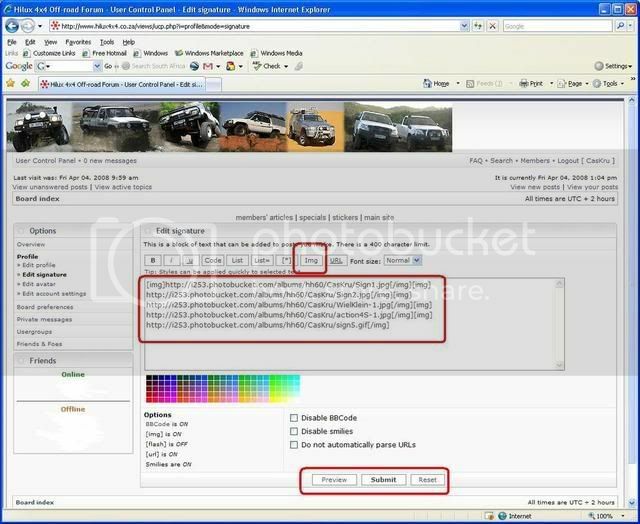 It will then automatically copy the link to your clipboard. All you do then is come to the forum (either in a post or signature editor) and paste. Only once you submit the post will it show the actual character. Thank you. I will keep trying. dis my boodskap, is my prentjies te groot? Hilux 1 wrote: It was not possible to determine the dimensions of the image. OK, just proved to be blond/stupid/old/techno disadvantaged. nou is ek ook n bietjie slim..
Hilux 1 wrote: OK, just proved to be blond/stupid/old/techno disadvantaged. 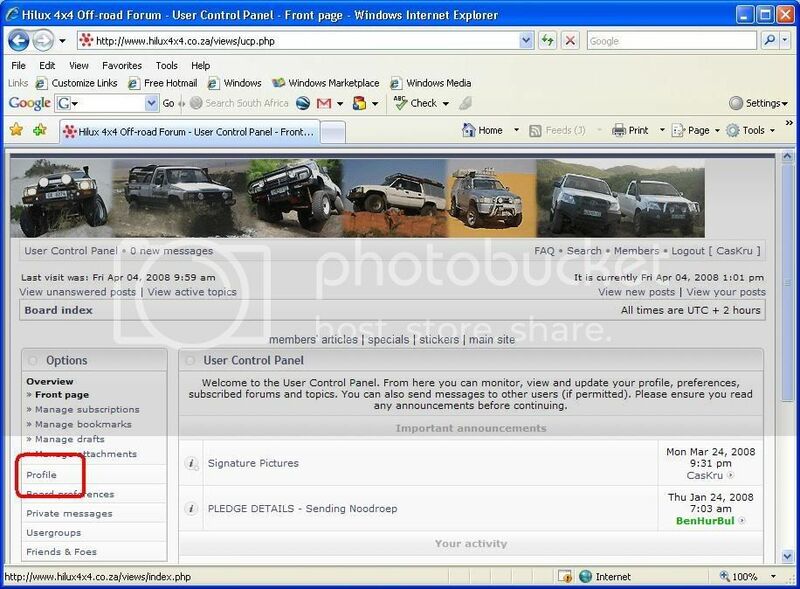 As hy dan vir een of ander rede kla dat hy nie die dimensies van die photo kan bepaal nie dan delete jy die lyntjie wat jy gepaste het, en gaan click op die "Direct Link" blokkie in photobucket.